I know. Pretty pathetic that this is the best shot I got of my kids all night. The hard part is getting the boys to sit still, back up far enough to get a shot, realize I forgot to take off the lens cap and to turn on the flash, and by then the boys are in the next room. Since this is such a bad shot, I didn't bother to crop it, but as soon as someone (Holly) takes pity on me (Holly!) and gives me copies of her pics (HOLLY!! ), I will post more of the kids in costume. 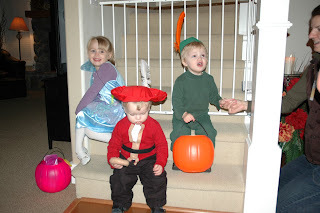 At least this gives you all an idea of what the kiddos from Neverland looked like last night. Ok, Ok, Ok! I'll e-mail the best ones, and get you a disk of the rest.